Fostamatinib resulted in clinically meaningful, ongoing platelet responses and a low rate of bleeding events in 43% of patients with chronic immune thrombocytopenic purpura (ITP) with long-disease duration who had been previously randomized to placebo in phase III studies, according to the open-label extension trial Study 049 (NCT02077192). ITP is an autoimmune disorder characterized by impaired platelet production and SYK-mediated platelet destruction macrophages. Fostamatinib, an oral SYK inhibitor, was developed for the treatment of patients with ITP and other additional autoimmune disorders. In 2 previous placebo-controlled, double-blind, 24-week phase III trials, Study 047 and Study 048, patients were randomized 2:1 to fostamatinib or placebo at a dose of 100 mg twice daily for up to 24 weeks. Results showed that fostamatinib demonstrated stable and overall response rates of 18% and 43%, respectively, in patients with chronic ITP. This led to the open-label extension trial Study 049 to evaluate the initial and longer-term follow-up of fostamatinib. This extension study enrolled patients who completed the 24-week phase III study, or who completed more than 12 weeks of treatment and were not responsive. Initial results were presented for patients who received placebo during the phase III studies and subsequently initiated fostamatinib in the extension study. All patients enrolled had previously been treated with placebo with baseline platelet counts of <30,000/μL and were rolled over to the extension study. Patients received fostamatinib at 100 mg orally twice daily, increasing after 1 month to 150 mg twice daily if the platelet count was <50,000/μL. An endpoint of the study was stable platelet response, with a platelet count of ≥50,000/μL within the first 3 months of treatment without rescue therapy and platelet counts of ≥50,000/μL at 2 of the 3 subsequent monthly evaluations. An additional endpoint included overall platelet response with a platelet count of ≥50,000/μL within the first 3 months of treatment without rescue therapy in preceding 28 days. Response duration was defined as time from first response to first of 2 consecutive study visits with platelet count <30,000/μL, need for rescue medication, or the onset of ITP-related adverse events (AEs). AEs were collected in the safety population, which included patients receiving ≥1 fostamatinib dose during the extension study. Of the 48 patients previously receiving placebo in the phase III studies, 44 (92%) initiated fostamatinib in the open-label extension study. All patients were adults with persistent/chronic primary ITP with an average of 3 prior unique therapies for ITP. Overall, patients had a median disease duration of 8.4 years. Ten (23%) of the 44 patients experienced a stable response when treated with fostamatinib and an overall platelet response occurred in 19 (43%) of 44 patients. The median time to response was 29 days, which was the first visit following the start of treatment. 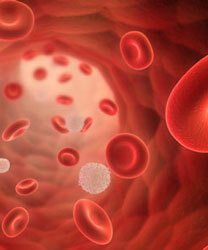 At the time of analysis, 58% of patients had ongoing responses with a median platelet count of 70,000/μL. The median duration had not been reached at more than 21 months. AEs were manageable and mild to moderate in their severity. The most common AEs were diarrhea (22%), hepatic disease (17%), and hypertension (16%). Treatment-related AEs—which were all mild (25%) or moderate (27%) and resolved over time—occurred in 23 (52%) of the 44 patients. Serious bleeding occurred in 7 (28%) out of 25 patients who did not respond to treatment compared with none of the 19 responders. There were 5 (11%) discontinuations due to AEs of diarrhea, sepsis, thrombocytopenia, pneumonia, and increased transaminases. Bussel J, Khalafallah AA, Arnold DM, et al. Fostamatinib, a spleen tyrosine kinase inhibitor, for the treatment of chronic immune thrombocytopenic purpura: safety and efficacy in patients initiating treatment in an open-label extension study 049. In: Proceedings from the 22nd Annual International Congress on Hematologic Malignancies®: Focus on Leukemias, Lymphomas and Myeloma; March 1 to 4, 2018; Hollywood, Florida.